For those of you in Las Cruces, I wanted to remind you that my lecture is tonight at 6 p.m. Parking is free after 4:30 p.m. on Campus. Glenn Schwaiger, an artist and associate professor at New Mexico State University and Dona Ana Community College, will present highlights of his latest trip to Jingdezhen, China, during a presentation later this month. 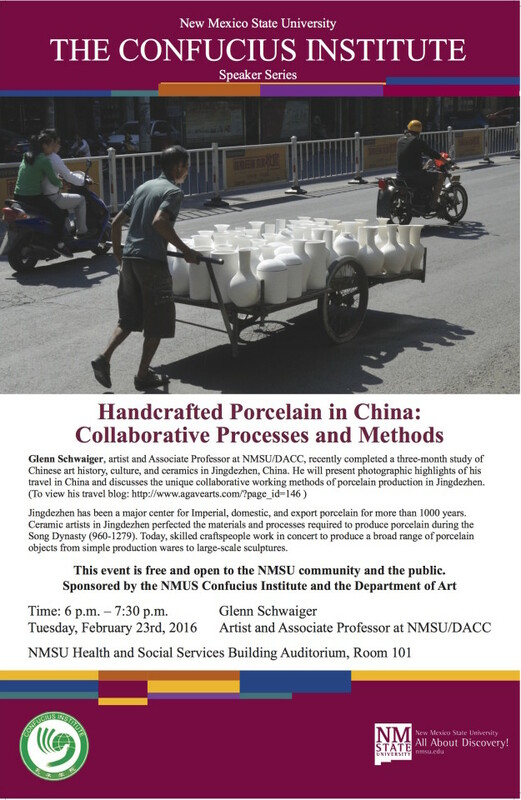 Schwaiger’s presentation, “Handcrafted Porcelain in China: Collaborative Processes and Methods,” will be from 6 to 7:30 p.m. Feb. 23 in the NMSU Health and Social Services Building Auditorium, Room 101. The presentation is free and open to the public, and is sponsored by the NMSU Confucius Institute and the NMSU Department of Art. Schwaiger recently completed a three-month study of Chinese art history, culture, and ceramics in Jingdezhen, China. Jingdezhen has been a major center for Imperial, domestic, and export porcelain for more than 1,000 years. Ceramic artists in Jingdezhen perfected the materials and processes required to produce porcelain during the Song Dynasty from 960 to 1279. Today, skilled craftspeople work in together to produce a broad range of porcelain objects from simple production wares to large-scale sculptures. I am very sorry that I couldn’t attend your presentation last night. I was so looking forward to it. Rosemary and Curtis were going to accompany me but the allergies took over and from 1pm until now I’ve been bed ridden with all kinds of symptoms, coughing pains and sore back, etc. Having just reviewed the results, I saw what appeared to be fantastic turnout. Congratulations. I will be looking forward to the availability of the presentation. Give our regards to LeeAnn. I would have enjoyed having you, Rosemary, and Curtis in attendance. I am hoping we will get an online link for the video that was taken. Maybe a trip to Silver City to repeat a similar presentation is in order? Let me know if there is interest from the Silver City folks.